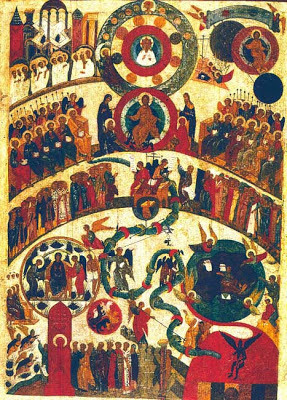 On the west wall of many Orthodox churches, a fresco of the Last Judgement can often be found – a graphic reminder as we leave church to continue to be good. While not as terrifying as the images in Hieronymous Bosch's paintings, the icon certainly points to a clear division between the saved and the damned. Now, this is a tricky one for me. I regularly recite the Creed, saying that I believe “He shall come again with glory to judge both the quick and the dead.” But what exactly does that mean? Throughout my Christian life to date, I’ve never had a problem with the limitless love and compassion of God. Like many other modern Christians, however, I am much less comfortable with the idea of a wrathful, vengeful God, casting unrepentant sinners into everlasting torment. I have, of course, always accepted that, if the ultimate glorification of the world is to be accomplished, there must be a reckoning of some sort at some time. However, there has always seemed to me something a touch hysterical and unhealthy in the relish with which some clerics describe in all their gory detail the tortures awaiting the damned and an all too human delight in the unjust getting their come-uppance. For a terrifying and dramatic example of this kind of sermon and its effect on young minds I recommend you read James Joyce’s ‘Portrait of the Artist as a Young Man.’ Strangely, the person preaching such sermons always seems to assume that he is not among the unjust! This is in sharp contrast to our own lovely parish priest who, passing us when we were looking at an icon of 'The Last Judgement', pointed at one of the sinners at the bottom and said, “That's me.” Moreover, the thought, implicit in ‘damnation theology’, that people only refrain from sin through fear of the fires of Hell is reminiscent of the theory that men don’t murder their wives only because they might go to prison! So, in the past, in my somewhat woolly, liberal way, I saw Hell not as a punishment imposed by a celestial Lord Chief Justice but as a self-inflicted agony. At the Last Judgement, I believed, one is confronted by the totality of God’s light – His purity, love, goodness. The knowledge of one’s failings would make it impossible to stay in that light and, in remorse and perhaps fear, one would turn away from the light into darkness. This struck a resounding chord in my heart and when I read further that “it is heretical to say that all must be saved, for this is to deny free will; but it is legitimate to hope that all may be saved,” I felt that I had found a true theology that expresses both the “goodness and severity of God.” This made, and still makes, much more sense to me than either the punitive, judicial idea of damnation or the more modern dismissal of the whole concept of Hell. If, as St. Gregory of Nyssa said, it is legitimate for Christians to hope even for the redemption of the devil, there might be a corner of Heaven for this poor sinner. This faith in the love of God and hope for the redemption of all has practical implications for a deeply emotive subject: the attitude of many Orthodox clergy towards suicide and the way in which suicides are treated. Suicide must be accepted in theory as the ultimate sin since it is a final refusal to accept God’s mercy. It is for the sin of despair that Judas is finally condemned rather than his betrayal: “In misery he lost his life, preferring a noose rather than repentance,” as one of the hymns of Holy Week puts it. And yet, in practice, it is rare for suicides in the Orthodox Church to be refused the full rites of Christian burial. It is argued that nobody can know what goes on in the mind of a person at the moment of death and, since God’s mercy extends to the latest of late repenters, how can we judge a ‘suicide’ with complete certainty? If, in the last seconds before death, the person repented, it is for God to judge, not us. Thus, with true Christian compassion, most ‘suicides’ are given the benefit of the doubt and buried as members of the Church. Please feel free to give feedback whether positive or negative. It seems that the comment box won't work unless you complete the Comment as... box. I don't understand all the settings but suggest you choose anonymous and put your name in the text (unless you really do want to be anonymous!) Name + URL (email address) should also work. Due to increasing Spam comments, I've had to introduce word recognition (CAPTCHA) but don't let that put you off. © Chris Moorey. Simple theme. Powered by Blogger.